Newly upgraded with stainless steel appliances, tile throughout and new bathroom with tiled walkin shower.Brand new Queen bed, AC in living area, washer/dryer in unit. Extra tall lanai seating! Near Shopping, Restaurants and all beach activities. Farmer's Market, coffee shop and beach park 3 blks away. Swim and snorkel right in front of property within our protected outer reef. Observe a myriad of sea life including, sea turtles, dolphins and whales in season! 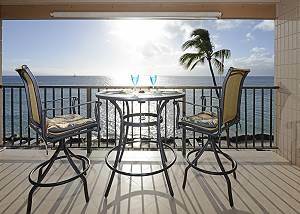 Free nightly sunsets from your private lanai! 2 Propane gas grills for BBQing with a sunset view! "Talk story" with our local residents and meet people from all over the world at the best condominium Maui has to offer! Always available for any questions or concerns! Wow view as you walk in the door. We only stayed one night, but wished it could of been longer. Loved having the open air and wonderful balcony to relax and eat on. A guest from LOSTINE, OR US recommends this vacation rental. The table and stools on the deck made our Maui experience perfect. Coffee and a pair of binoculars (brought from home) provided I ncredible whale watching. In the afternoons we watched turtles swimming by and in the evening watching the sunset was incredible. The kitchen and bathroom were beautiful tiled. The breeze through the bedroom, a comfortable bed and the sound of the ocean made for some restful sleeping. Short walking distance to a decent grocery, fish market and deli. We will definitely stay here again. We had a great stay at kaleialoha rentals. The view was fantastic. We are recommending this place to our friends. Charisse P. from Lahaina, HI United States recommends this vacation rental. Had a great stay. Location was excellent, right on the water and walking distance to stores and eateries. View from the lanai was amazing. Complex and unit were clean and nice but could use a little updating. Sea wall is under repair and roped off so that was unfortunate. Awesome vacation overall! Would recommend! Aloha and Mahalo for your comments! There is still full access to the adjacent beach and we are working hard to repair any areas of the seawall affected by Mother Nature! Hope to see you again! I am a repeat happy Kaleialoha renter for a number of years. Unit 312 was very clean with a well stocked kitchen. It is always great having a washer and dryer in ones unit. I really enjoyed staying on the third floor this year with being able to look over the water and search for Turtles and humpback whales which I saw plenty this year. One of the delights is coming back and seeing and socializing with the same people where we meet at 5pm each day for our cocktail hour. rental manager was super in handing issues which I was very grateful. I had a guest who used the convertible couch who said the mattress was very good and even looked for the brand in order to buy it for her home. Condo co,lex is being well maintained and love the front and side lunch garden area. They three BBQ grills are used regularly by residents and guests. Erosion/Global warming has washed what little beach there waa. The only negative is the sea wall is still being repair so this is the second year that we were unable to use it thus there were no pupu parties or a BBQ for charity. I am hoping im 2019i it is fixed. Yes, I am returning again and also rented another unit for two weeks for my son and family. I would have rented 312 again but it was already booked for 2019. Mahalo. Dorena C. from Lahaina, HI United States recommends this vacation rental. This rental is all that it claims to be; beautiful, comfortable, clean. The location is superb being closely located to the airport, front street, many beautiful beach access locations, the town of Paia and so on. It's conveniently close to farmers market and grocery stores. Perfectly located for nice walks. The bbq and lounge area are gorgeous and well maintained. The pool is lovely for evening swims. Just couldn't be more perfect. Thank you so much for a wonderful stay. Everest L. from Lahaina, HI United States recommends this vacation rental. We stayed at Kaleialoha #312 and we loved every moments. It was paradise and we never wanted to leave. We had everything we needed and wanted. We save a lot of money from eating out. They had pots, pans, dishes, silverware, everything, even a rice cooker. It was very peaceful and serene. We were very excited to see the colorful rainbows and sunsets from our lanai many times. I believe sunsets happened everyday around 7 PM. We saw turtles swimming from our lanai almost everyday. It was perfect to have our breakfasts on the lanai every mornings. We were very close to the water that it felt like we were living on water. Hearing and seeing the waves everyday were very soothing and calm, and peaceful. We love very much to come stay here again. The stay was perfect. Mahalo. Mahalo for the kind comments and hope you come back soon! A guest from Portland, Oregon United States recommends this vacation rental. Comfort and quiet with a view! Miles K. from Lahaina, HI United States recommends this vacation rental. We loved our stay here and would absolutely return. Location is great, balcony view was amazing, and snorkeling with seat turtles right off the back yard was a huge plus. Fab. Jeanne A. from Otterburne, Manitoba Canada recommends this vacation rental. Took the kids on this trip (first and only as for flying on an expensive trip, told kids this may never happen again so ENJOY! ), we were blown away of the beauty and the accommodations of this rental. Had all we needed and the view from the balcony was awesome! Met with one of the Chairpersons (Allen, hope I spelt the name right) for the Condo and expressed the same of what I'm mentioning on this review. I'd like to thank the owner of this room#312 for all what we got and experienced! The kids got to see the sea turtles and on the final day we could see whales out in the far distance. Times Super Market was a big bonus to have within walking distance. Being from Canada where we returned to -30 Celcius/-22 Farenheit but at least missed a Blizzard during the time in Maui, you sure appreciate the weather along the West Coast of Maui. Wish we could have met the condo owner to express our Joy and have a cheers or more! michael k. from dearborn heights, michigan United States recommends this vacation rental. Our stay at Kaleialoha Rentals #312 exceed every expectation. From daily breath taking sunsets and frequent turtle sightings to very clean and nice looking apartment. What is there not to like about this place? Highly recommended for anyone who wants to stay on Maui and have a great time. Glenn H. from Stoughton, WI United States recommends this vacation rental. Tom R. from Lahaina, HI United States recommends this vacation rental. This condo has most everything one needs in Maui. The surf breaks about 30 yards from the condo building. This unit is on the third level, so the views of the sunsets are spectacular. The owners provide beach chairs, boogie boards and towels. The kitchen and bathrooms has been updated. There are several beaches within short driving distance. It's also close to shopping, restaurants, and the farmers market. Elizabeth L H. from Lahaina, HI United States recommends this vacation rental. Immediately upon stepping in to our condo for the week, we felt right at home. It was nicely furnished, well equipped and tastefully decorated. Their were personal touches that added to the welcoming feel of the place. The very best of all was the incredible view! Just feet from the oceans edge, we could see turtles frequently and whale spouts and actual whales every tinpme we looked outside. The sunsets were awesome! We will definitely try to book this facility again! Our fifth trip to Kaleialoha and we keep coming back because it is the perfect spot for us. We are getting a bit older (60's) and like the quiet, clean, hideaway that comes with a view and the Kaleialoha fits like a glove. I would be hard pressed to find something wrong with the either the grounds or the condo but I don't want to alert all the prospective visitors to stay here as it would cut down my chances of staying here. Within walking distance of the farmers market and four or five eateries as well as an ABC store with a gas station in a small area known as Honokawai. Lonnie handles our reservations and we are so pleased with her, she makes things go without any problems. She doesn't manage all rooms but can make your stay comfortable. We were there for just a few days in this lovely condo and thoroughly enjoyed our stay. The soothing sounds of the ocean waves at night are still echoing in our heads. The markets a few minutes away were a lovely bonus. A guest from Ben Lomond, CA United States recommends this vacation rental. The condo was perfect. After staying in Kauai at the Westin for 5 days it was wonderful to get back out of resortville and into our comfort zone. All we wanted was a view of the whales and we got that in spades. The view was exactly what we wanted. The bed was comfortable and the kitchen well equipped. It would have been nice to walk on a beach but just a short way down the road and we found it. Di/ Ivan U. from Lahaina, HI United States recommends this vacation rental. Our rental vacation stay with Kaleialoha was an amazing experience. Way better than staying at a hotel. The condo had everything we needed from a fully equipped kitchen to swimming gear and plenty of towels and beach towels as well. The property was clean as well especially the bathroom :) To top it off our lanai was beautiful. A guest from San Jose, California United States recommends this vacation rental. I am responding to the survey of this unit #312 in behalf of my sister and her husband, who do not speak English, and came all the way from Europe to visit us in California. We took them for a one week vacation in Maui, and they both loved and enjoyed very much this clean and tastefully upgraded unit. The great ocean front view from a third floor balcony, the swimming by a clean sand beach just at the “doorstep” of the resort, it all added to their enjoyment. George U. from Owens Cross Roads, Alabama United States recommends this vacation rental. Loved the condo. Bed was a little hard for my my taste, but the view and location were awesome. Will definitely look at coming back. James W. from Cassville, MO United States recommends this vacation rental. This was our second trip to Maui and our second stay at Kaleialoha. And once again we found both experiences to be wonderful! If you are looking for a quiet, uncrowded, restful place to stay, soak up the sun and surf, swim with the sea turtles...then this is the place for you. We had absolutely everything we needed for a comfortable stay and only wish we could have stayed longer! If your idea of a vacation is to stay in a busy hotel or a high-rise condo unit laying out with hundreds of strangers, you probably want to consider different accommodations. Kaleialoha is perfect for us, a chance to get away from the crowds and enjoy Paradise! Thanks Lonnie! Hope to see you again in a couple of years!!! A guest from Russell Lea, NSW Australia recommends this vacation rental. Overall great place to stay: good price, exceptional location and very comfortable for two people. Wouldn't hesitate recommending to friends and will certainly book again when next in Maui! We enjoyed very much our recent vacation. We have rented this unit before and it was very relaxing and pleasant. The view out the front windows is fantastic! We would definitely come back! Lylia L. from Saugus, CA United States recommends this vacation rental. We have stayed in this particular condo several times. It has an outstanding view of the ocean. There is a small beach off to one side and good snorkeling right in front of the condo. It has any kitchen gadget you would need. The pool is tiled and always a comfortable temperature. Geoffrey R. from Shoreline, Washington United States recommends this vacation rental. Took my girl friend to Maui to see if she would consent to be my fiance - thnks to a wonderful time at an outstanding location with an unabstructed view of the nightly sunsets she said YES!!!! The location of this unit is such that you have an unobstructed view of the passage between the islands of Lanai and Molokai. This may not mean anything to the first time traveler but it results in absolutely stunning sunsets because the sun is visible all the way into the sea on the far horizon. A few short miles away in Lahaina, the sun sets behind the island of Lanai and you loose the last few minutes of this heavenly light show. The high seating in this unit alows you to have your breakfast on the lanai watching the rainbows, turtles, birds, paddle boarders, surfers, sailboats and whales (in season) without haveing to peer through a railing and believe it or not, that's a big thing. We had a fabulous time - snorkling was good just in front of the unit and the daily flow of turtles that stop to feed on the reef and play in the waves is not to be missed. Being on the third floor was a bonus as the angle of vision to the water was sharp enough to allow good visibility of this daily ritual. We had a fabulous time and would highly recommend this unit to anyone wanting a romantic get away. This is a small complex not some megalithic hotel structure so there is no "combat sunbathing" where you have to fight for every square inch of space. There is plenty of room to stretch out and relax which, after all, is what you're there for, right?!?! This condo was fabulous. The location was wonderful, listening to the waves at night was so peaceful. The location was ideal, with a lot of possibilities nearby. We loved the beach, watching the turtles and swimming in the waves. Road to Hana is a must as well! We had a minor blip with our wireless connection that was corrected once we told management. Angela M. from Fairbanks, AK United States recommends this vacation rental. Kyle P. from Houston, TX United States recommends this vacation rental. This beautiful condo is located in a superb location and is the perfect place for rest and relaxation after a fun day of playing in the water and the mountains. We swam with the turtles and enjoyed watching them every day from our lanai. This condo has everything and more from linens to pots and pans and a gorgeous view. We are already making plans to come back! My parents and I recently vacationed on Maui. Our condo was perfect! The view is amazing, we spent every morning sitting on the lanai eating breakfast watching the whales and turtles. We had a whale breach very close one morning. The location is quite but close to beach, dining and shopping and Lahaina. The grounds are well maintained , great pool and community grill. The condo has been updated with beautiful shower and kitchen. The fold out couch is comfortable, I loved sleeping with the sliding doors opened and listening to the waves and feeling the breeze. Staff were friendly and helpful. We loved, loved this place! I hope to return soon. Lori B. from Calagry, AB Canada recommends this vacation rental. The unit we stayed in was great - turtle pictures, a turtle mosaic on the shower floor, and an incredible view of the ocean from our balcony. There is a reef right in front where large green sea turtles come to feed on a daily basis - soooo awesome! The unit is well equipped, including A/C, and we lacked for nothing. Loved it! Francis L. from Oradell, NJ United States recommends this vacation rental. Perfect paradise for our 15 year anniversary! Eric D. from Abilene, KS United States recommends this vacation rental. We stayed in #312 to celebrate our 15 year anniversary. We have heard that Hawaii is a paradise and we were not disappointed! The condo was nop notch! We walked into a very clean, well-maintained and well-stocked kitchen! The only issue we had was the handle of the toilet kept coming undone. We loved the location of our room-the views from the balconey toward the ocean were perfect. Every meal we had in the condo was spent out there taking in the spectacular view! We appreciated the relaxed atmosphere. We borrowed the Road to Hana CD from the office-they were very accomidating! Thanks for great week in paradise! Great stay overlooking the ocean! Mark M. from Somerset, UK United Kingdom recommends this vacation rental. We had a fantastic 2 nights stay in this amazing condo. The views out to sea were great to Whale watch and we got to see Turtles close to shore outside our apartment from the balcony. Great sunsets and lovely place to stay. Like a home from home with greater views. Kaleialoha is a great place to stay!!! Dan & Barbara C. from St. Joseph, MO United States recommends this vacation rental. We have stayed at Kaleialoha for many years now and love coming back each winter. It is very convenienttly located to anything you want to do. Tracy T. from Portland, OR United States recommends this vacation rental. Gorgeous views, up to date condo with everything we needed. Janice Q. from 1940 Pineview Dr, AZ United States recommends this vacation rental. We loved our condo-great location. Fantastic views of ocean and wonderful to see so many whales and turtles. Would definitely stay there again in the future. They do need to have the toilet checked-continues to run if handle not pulled up after flushing it. Also need a new small fan that works. Why does anyone stay in Kaanapali? Jill & Ned S. from Portland, OR United States recommends this vacation rental. Perfect unit, quiet and friendly neighbors, comfy bed, big shower, and some kitchen basics provided. A sea turtle crawled onto the beach right in front of us, not 15 feet away, on our first night. Amazing. Laura P. from Lolo, MT United States recommends this vacation rental. Kaleialoha is a wonderful place to stay. We have stayed here numerous times and we are never disappointed. Unit #312 has been our favorite unit so far. A guest from Provo, UT United States recommends this vacation rental. Very nice property, unit and location. Wonderful to wake up to the sound of the waves and watch the turtles swim below the each morning. We are a repeat renter of this condo room and it has been improved since our last stay. A nice new shower area and new kitchen eating areas were among the remodeled areas. Overall, it was another great trip to Maui. Marleen C. from Avon, OH United States recommends this vacation rental. Dan and I have stayed at Kaleialoha for many years now. It is a great place with the ocean right in front of you to stay. We love meeting our friends again every winter when we come to stay. Also Lonnie and Kathy are the absolute best when it comes to making sure everything is OK. They could not be more helpful and accommodating. Carol O. from Jacksonville, TX United States recommends this vacation rental. We arrived in Maui after dark and very tired from a long flight. The next morning we awoke to a picture perfect view. The ocean was so close we could see fish swimming in the water. And the sea turtles were feeding right below our balcony. Everything in the condo was exactly as pictured. The kitchen was updated and had everything we needed. The A/C was appreciated in the evening when there wasn't a breeze. The location was great as we prefer to not be in the middle of the tourist area. We would definitely stay here again and highly recommend it. Ines N. from Lahaina, HI United States recommends this vacation rental. Amazing holidays. The balcony view is perfect. Leonard W. from La Quinta, CA United States recommends this vacation rental. This was a dream trip to Maui!! My girlfriend and I were fortunate enough to have chosen a great location, great building and perfect unit for our needs! We wanted to be away from the huge hotels of Ka'anapali and Kihee, but close enough to the action of Lahaina and smaller towns along the west coast of Maui. We were super pleased with the location, cleanliness and overall facilities. The unit itself was clean and well stocked - recent renovations make the kitchen and bathroom two of the best areas of the unit. The lanai is amazing as well - having the high chairs was a big bonus for gazing at the turtles, sunsets and anything else. The location is great!! Close to awesome beaches, snorkeling, serenity, shops and restaurants. But, far enough away that it doesn't feel cookie cutter. There are many units that are owner-occupied. Very little road noise as the units are far enough away from the road. Also, respectful guests for the most part - please do your part if you stay here. Overall, I would rate this a 10/10 or 100/100 if I could!! Can't wait to stay here again next year!! Jean P. from Portland, OR. United States recommends this vacation rental. First time at Kaleialoha. The view was exceptional! We loved it. Cannot wait to come back and we will. Our condo 312 was beautiful and clean. Snorkeling & swimming with the turtles was awesome. The pool was like a bathtub. That was a plus. We met the nicest people and are even Facebook friends. Shopping is always the best in Lahaina but must admit our trips to Kihei. 10 days was definitely not long enough. We love Maui. A guest from Hirakata, Osaka Japan recommends this vacation rental. perfect location, clean rooms, and enough amenities. love to watch beautiful sunset from Lanai. lots of Sea turtles comes private beach. very comfortable staying, perfect for honeymoon. Michelle A. from Sacramento, CA United States recommends this vacation rental. I love this place! #312 specifically! I've stayed in this unit a couple times now and feel perfectly comfortable! Description was accurate! My only concern would be the bathroom cleanliness. The bathroom rugs need to be cleaned before each persons stay. They were obviously used before our stay and not cleaned in between. Also, the grout on the shower floor needs to be scrubbed a little better each cleaning to justify such a high cleaning fee. When I got out of the shower the white (clean) towel I had layed down had yellowish brown foot prints - and not because I hadn't cleaned my feet while I was in the shower. Bathroom and kitchen, but mostly bathroom cleanliness needs to be high priority. I will however stay here again!! I'll just hope for the best in the cleanliness :)of the bathroom. Aloha! My guess is from the red dirt prevalent on the island! It will not come out even with bleach! Maybe that's why the natives used it to dye things! Glad you enjoyed your stay other wise! Debbie A. from Lincoln, CA United States recommends this vacation rental. A guest from Spokane, Washington United States recommends this vacation rental. Jean L. from Yountville, CA United States recommends this vacation rental. location; exceptional views; excellent maintenace, and Lonnie is a friendly and good Office Manager. Great Place! Loved our visit! A guest from Rowlett, Tx United States recommends this vacation rental. Our stop in Maui was after a 4 week trip to Canada and Alaska and we knew we'd be wanting a rest at the end. We had been to Waikiki before and even though we love it there, Maui was just what the doctor ordered. Our unit (312) was absolutely beautiful. We didn't arrive until nearly midnight and when we walked into the unit the TV was on, the balcony doors open so we could hear the surf and a beautiful fruit basket welcomed us. It was like coming home. The next morning we couldn't wait to see the ocean and view from our balcony and we weren't disappointed. The high lanai setting made it perfect to just sit and watch all the activity below, especially the turtles. We were mesmerised by them! Also the outriggers came up close to see the turtle and it was nice to see the odd cruise ship sail past. We had perfect weather and really enjoyed sitting in the lounge chairs out front of the building. Dinner was an excellent time to meet people around the BBQ and everyone was so friendly. And of course the magnificent sunset each evening was something we looked forward to. The unit had everything that opened and shut. Even a TV in the bedroom although with the view we had, we didn't watch TV at all. The lounge was really comfortable and ample room in the unit. We had friends over for dinner one night (they were staying at the Westin Resort) and there was plenty of room around the dining table. They were so impressed with the unit, they said they wouldn't stay in a resort next time. 7 days wasn't long enough and we're already planning a trip back next year. I can't wait!! Kaleialoha really is beautiful one day and perfect the next!! Mahalo. Arrived after hours and gaining access to unit quite easy. Awoke to the view and sounds of the pacific; walked down to the farmers market. Sat on patio eating fruit, listening to the waves, watching professional employees fine tune the outside property and knew this was the spot. That was just my FIRST day. Brett & Laura S. from Springfield, OR United States recommends this vacation rental. Nancy W. from Honolulu, HI United States recommends this vacation rental. Tomer T. from Woodland Hills, CA United States recommends this vacation rental. Toivo S. from Lake Oswego, OR United States recommends this vacation rental. This is where we always stay in Maui. Close to everything, but not in the middle of the resort craziness. Georgeous view, turtles, whales, and nice amenities in condo. A guest from Maple Shade, NJ United States recommends this vacation rental. The unit was great. Clean, nice shower, fantastic view - sunsets, rainbows, and whales...unreal. I liked the closed sides of the balcony, very private. I also enjoyed using the telescope! What a cool surprise. Only thing that bothered me in the least was the double mini coffee tables, would have preferred one longer table. But that is it! The property manager was very friendly and helpful, goes the extra mile if you need it. Mahalo :) I'd definitely stay again. Beautiful View, Beautiful Condo, Amazing Vacation! Matthew G. from Clovis, CA United States recommends this vacation rental. Edward B. from Des Moines, Wa United States recommends this vacation rental. Needed a last minute room at the end of my trip. Staff was very friendly and squeezed me in for a three night stay. Great view, room was just right, made my last days on the island a treat! Everyone on sight was helpfull and friendly. Will check first her next stay.